Explore the 2018 information below to see what to expect! CLICK HERE for Where can I find brochure maps? NOTE: The brochure map is 11x17". You can download the file and print to scale on regular, letter size (8.5x11"), but it will be VERY small print. 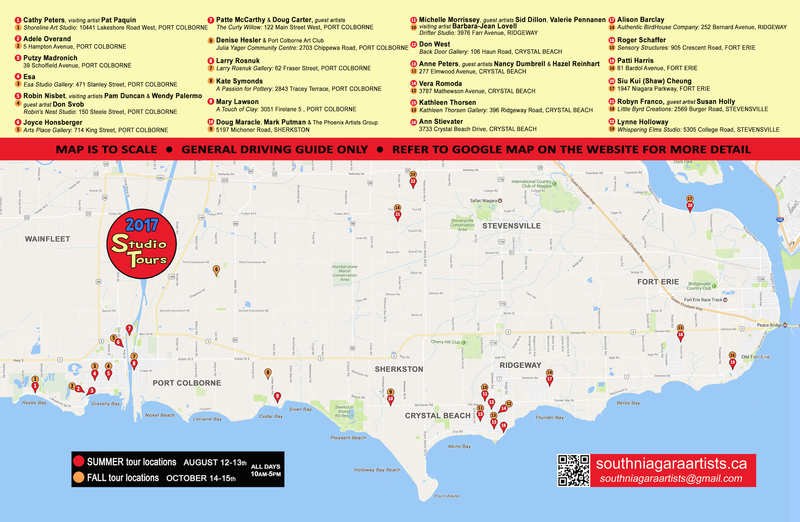 We recommend you pick up a brochure map from one of the MANY locations around Niagara. ​Click on the link above "Where can I find brochure maps?" Check the Google Map for EXACT locations and UPDATES. NOTE: The brochure map is only a guide and does NOT INCLUDE new artists and location changes. The location pins have been updated to 'BLUE' for Fall Tour participants. Google Map lists the studio location names, not specifically by artists. All artists at the locations (host, guest, visiting) are in the details. Click on the location number to learn more about the artist(s) at that studio for the Fall Studio Tour. FOLLOW THE BLUE DOTS ON THE MAP FOR FALL 2018 LOCATIONS!